Real Madrid captain Sergio Ramos has reportedly threatened the club with an exit if they choose to bring former boss Jose Mourinho back to the Santiago Bernabeu. After their incredulous collapse in the span of one week - crashing out of the Copa del Rey, enduring a second defeat to Barcelona in La Liga and exiting the Champions League- rumours of a managerial reshuffle at Real Madrid have been regularly doing the rounds. While some publications have claimed that club president Florentino Perez had asked Zinedine Zidane to come back to the club as manager, others have suggested that Jose Mourinho will be the one to take over Santiago Solari. The 56-year-old Portuguese manager was sacked by Manchester United in December last year after a series of disappointing results and dressing room feuds left the team disillusioned. The Daily Mail UK now reports that if Mourinho makes his way back to the Spanish capital, Sergio Ramos will leave in the summer. The Spaniard had public spats with the former Blancos boss between 2010-2013 and is reportedly not keen on working under him once again. The report further claims that the defender will push for a summer move when he is one year from the end of his contract. Gareth Bale, Marcelo and Karim Benzema are also among the players who are opposed to the idea of signing the Portuguese. Club president Florentino Perez is reportedly scheduled to meet with club directors to discuss the Mourinho's potential signing today. The report alleges that if signed, Mourinho's contract will be worth £17 million and will stretch for a period of three years. 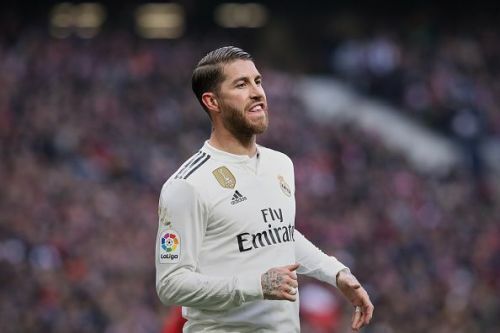 Ramos' row with Perez following their Champions League elimination has been widely reported and it was believed that the captain even asked the president to pay him up so he could leave. While Solari's future at Real Madrid will undoubtedly see its end soon, it remains to be seen whether the club will also lose a true-blue Galactico like Ramos in the process.